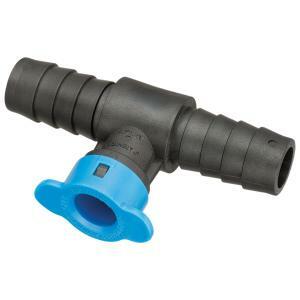 These Blu-Lock Barbed Tee x 1/2" BL Swing Adapter are used to connect Blu-lock pipe of corresponding size to Blu-Lock 1/2” swing pipe. Used to connect 3/4” and 1” BLU-LOCK® tubing with 1/2" Blu-Lock Swing Pipe. Blu-Lock® by Hydro-Rain® is the fastest, greenest, irrigation installation method in the world. * For non-constant pressure valve-out outdoor irrigation connections only.